Chilean President Sebastián Piñera called for “dialogue, meeting, coordination and collaboration that favours the integration and development" of the region's nations yesterday, as he hosted the inaugural summit of the Forum for the Progress and Development of Latin America (Prosur). 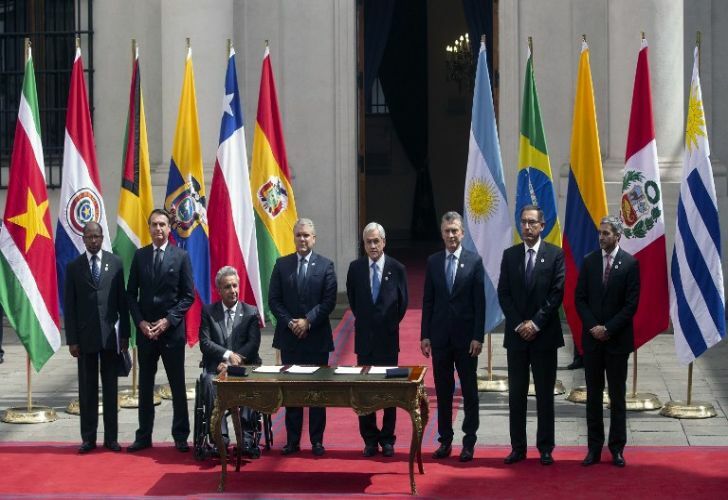 Set against the backdrop of an ongoing crisis in Venezuela, President Mauricio Macri joined the leaders of Chile, Colombia, Argentina, Brazil, Ecuador, Peru and Paraguay in Santiago yesterday to sign an accord kicking off the new regional initiative. The head of the opposition-controlled National Assembly of Venezuela, Juan Guaidó – who has been recognised as the crisis-stricken country's interim president by more than 50 governments worldwide, was also invited to the meeting, though he was unable to attend. Prosur has been born amid the resurgence of the conservative right in Latin America. 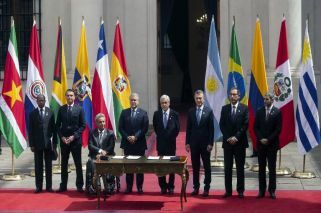 Piñera and Colombian President Iván Duque have led the charge for the new alliance. The new agreement would take the place of UNASUR, which was promoted by the late Venezuelan President Hugo Chávez and has been inactive for more than three years. The countries plan to model their forum on the successful Pacific Alliance, according to reports, which is made up of Chile, Mexico, Peru and Colombia. "We want it to be a forum without ideologies, without bureaucracy, a forum of frank and direct dialogue with a clear commitment to the principles of freedom, democracy and respect for human rights," said Piñera during the opening of the meeting. For the Chilean president, this new forum is "necessary and urgent." The exclusion of Venezuela and the rejection of Nicolás Maduro's government unites the countries that have elected to participate in Prosur. Duque revealed that he spoke with Piñera and other leaders about the possibility of giving asylum to military deserters from the Maduro government, so that other troops will follow suit and rescind their support for the Venezuelan ruler. "It is an issue that we have been discussing with several countries after the events of February 23," Duque said in an interview with Channel 13, referring to the failed attempt of several leaders, including Piñera, to send humanitarian aid into Venezuela through the Colombian city of Cúcuta, which rests near the border. "The strongest message is to invite [the military] to make a move in favor of democracy in Venezuela, and to generate a 'domino effect,' where we have a massive movement of troops that do not recognize Maduro as the leader of the country," added the Colombian president. According to Duque, his country has already received some 1,200 Venezuelan military deserters. The government of Nicolás Maduro has rejected the statements made by Piñera and Duque about the crisis in Venezuela, considering them a gesture of "submission" to the United States. With the withdrawal, UNASUR, which initially was comprised of 12 nations, would be reduced to a group of five countries: Bolivia, Guyana, Suriname, Uruguay and Venezuela. "We are ready to start a new stage in the integration of South America," Chilean Foreign Minister Roberto Ampuero said on Thursday afternoon. According to him, the integration proposed by Prosur "is a pragmatic integration" and "without any type of marginalisation." 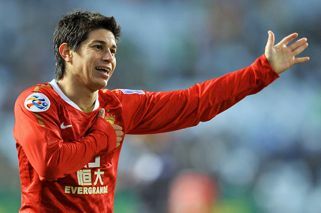 However, several South American countries have not expressed interest in the new organization. Uruguay, which sent its vice-chancellor to the meeting, opposes its creation, while Bolivia continues to defend the existence of UNASUR. "In the creation of UNASUR, the mistake that was made was that it had a certain political ideology. To generate another process of integration also with a political ideological purpose is to commit the same error as before," said the Uruguayan president, Tabaré Vázquez. The meeting in Santiago has also been met with resistance from citizens. Groups of leftists and gay rights organisations called for protests this Friday afternoon in Santiago, against this "summit of right-wing leaders" and the presence of Brazil’s Bolsonaro at the conference. Over the course of the discussions, the group of South American leaders will "appreciate, assess and sort out the experiences of the past," as well as look at "what comes next," said Piñera. They also plan to address “challenges and opportunities for regional integration," with a focus on issues such as health, social security, energy, defense, natural disasters and the environment.